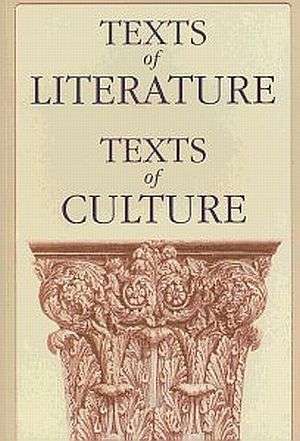 Texts of Literature, Texts of Culture brings together a variety of theoretical approaches to the problem of literatue versus culture. The question is considered in a series of case studies of literary, cultural and borderline phenomena in English language literatures which focus on a wide range of genres (medieval lyrics, mystery plays, Harlequin romance, detective novel, psychological novel, fantasy, science fiction) and authors (from Chaucer and Shakespeare to Bowen, Malamud, Vonnegut, Stoppard, Rushdie, Mc Ewan, Coetzee). The theoretical positions extend from the radically essentialist to the more eclectic ones, drawing on semiotic, narratiological, mythographic, and even radical constructiviest ideas. Ragardless of the particular differences in their individual approaches, the contributors to this book consider the study of literary texts qua literary texts as a legitimate and cognitively rewarding activity. Consequently, they tend not of endorese the trends prevalent in the criticism and literary studies of the final decades of the last century with attempted to dispose of the distinction between literary and non-literary (cultural) texts, replacing it with the notion of discursive practices and introducing total freedom in applying the same methods of analysis to texts traditionally deemed literary and non-literary.